Alex asked in the comments to my post on what to drink with breakfast whether I was a morning person, in that I don't necessarily need a big caffeine kick to start my day. I would probably have to say yes, I am a 'morning person'... I would much rather be up early getting things done than staying up late to do them... But that said, I also acknowledge that I *do* rely heavily on tea-sourced caffeine to get me through the day, more than I ever did before my son was born! I used to think that caffeine was evil, back in my hippy-herbal-tea-only days; it supposedly dehydrated you, tanned your insides and kept you awake at night. I have fortunately moved on since then, particular since discovering the many, many wonders of loose-leaf, high-quality C. sinensis. I try not to overdose on caffeine, but it is extremely difficult to determine how much caffeine is in any particular tea; the safest thing to say is that all tea made from Camellia sinensis leaves will contain caffeine regardless of whether it is white, green, black, wulong or pu'erh. This article by Nigel Melican explains some of the factors that influence caffeine content of tea, and why it is so complicated to quantify; it gets a lot of mentions (I am sure I have linked to it before) but that's just because it is so damn good. You should read it if you haven't already. And then have another cup of tea... that's what I'm going to do! As you can see it's rather crazed and the crazing is a bit stained - so I'm going to have a go at cleaning it (carefully). Also some of the gilt is a bit worn on the handle, but there's nothing else wrong with it - it pours beautifully with nary a dribble in sight and it is a good size (holds about a litre, which is comfortably between my 2-cup pots and my 6-8 cup pot). I also had the good fortune to be the recipient of a large collection of Noritake cups, saucers and plates, courtesy of a friend whose parents didn't want them any more, and who had no use for them himself. There are about ten demitasse cups and saucers, three trio sets of full size cups and a few extra plates - all in very good condition despite being very old (I believe they originally belonged to my friend's great-grandparents). I don't know much about researching china patterns - does anyone have any handy tips? 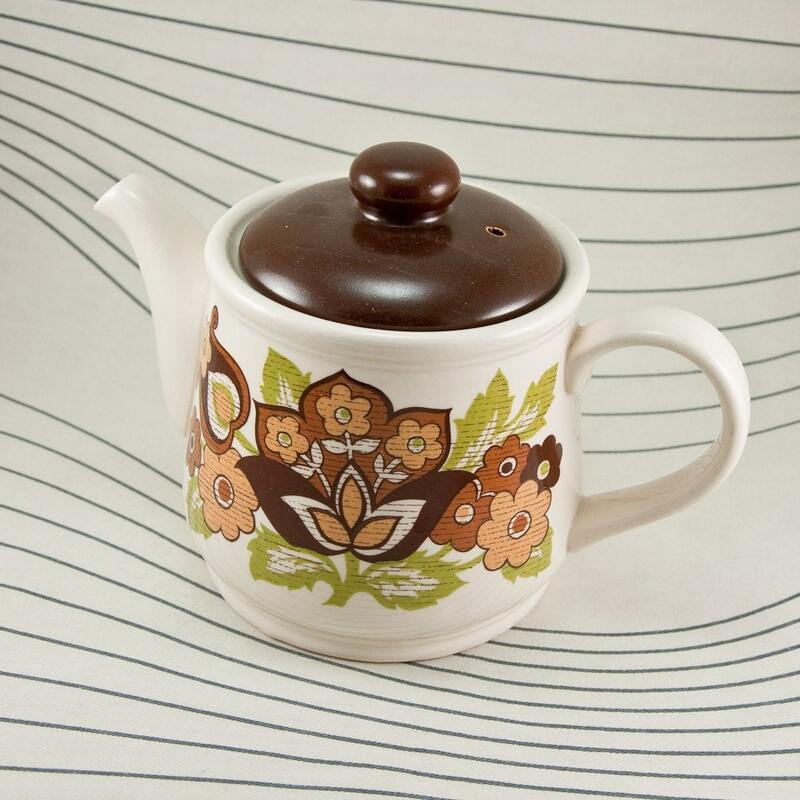 I would love to know the name of the Noritake pattern; it's not like any Noritake I've seen before! Think about it. The more water you put into a pot, the hotter it will stay. A smaller amount of water will cool faster, even if you warm the pot first. This will affect the way that the tea brews when you put it into the pot. Even if a tea is meant to be brewed with water that has just come to a full boil, it is not meant to be kept at that temperature but to cool gradually as it steeps. This is why it is not recommended to place a tea cosy over your teapot while the leaves are still in there; the tea will stew. 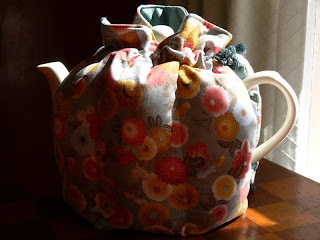 I also think it is why some teas do not taste as good when brewed in a larger pot (much as I love my 6-8 cup London Pottery teapot, seen here coyly wearing its tea-cosy [tea-leaf free], it is better suited to herbal and robust black teas rather than anything more delicate). Sometimes even brewing a two-cup pot rather than a single-cup pot can make a difference; I feel that the delicious Keemun from SanTion tastes better only brewed a single cup at a time, for example. Have you had a similar experience with the teas that you drink? 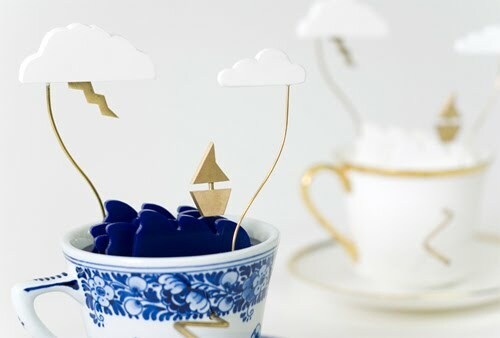 Tea Stuff Round-Up: Mind-boggling Prices, Tourism and more! Tea often seems to be touted as a (relatively) inexpensive luxury, particularly when you can infuse the same leaves multiple times. However, over the last few days my twitter stream has been boggling at recent news reporting that shows the commodity price of Da Hong Pao (Big Red Robe) has risen to $30,000 per kilogram. Yes... even if you could get say, 8 infusions from your teaspoon's worth of leaves... that's still damn expensive tea! I have recently discovered the Travel and Tea blog - great photos of tea around the world, by the way - and was interested to read about tea tourism in India. I wouldn't mind staying at a tea plantation in Darjeeling... There are also apparently tea tours available for visitors to Taiwan. I'm far from being a seasoned traveller, and confess happily to being very much a homebody, but I would love to visit tea-producing areas and see how the process works. Too exciting! ...as tea drinkers we really do not want it to ever be sanctioned and regulated by the FDA as a medicine. This would have enormous and far-reaching impact on the tea industry which would severely damage it, because aroma, flavor, tradition, character, etc. have no bearing on the validity of a substance as medicine. Medicine just has to do what it is sold to do. When I was completing my naturopathic studies there was regular discussion of similar problems regarding the use of herbal medicines and the level of regulation which they attracted - trying to find the balance between safety and 'proven' efficacy - not simple (and of course herbal medicine is big business these days as well). The thing with herbs - and I'm including Camellia sinensis tea here as well - is that they are so much more than the sum of their parts, and when you put them into the complexity of the human body - no wonder it's hard to get a standard response. But should we want to? I think probably not. And finally - have you ever wondered why the tea leaves sink to the bottom of your cup rather than sticking to the sides? No, I haven't either. But now that I've seen this article explaining the science behind 'the tea leaf paradox', discovered by Einstein no less (thanks to this post by Tea Guy for the link) I realise that I probably should have! And I feel ever so much better informed. So should you. 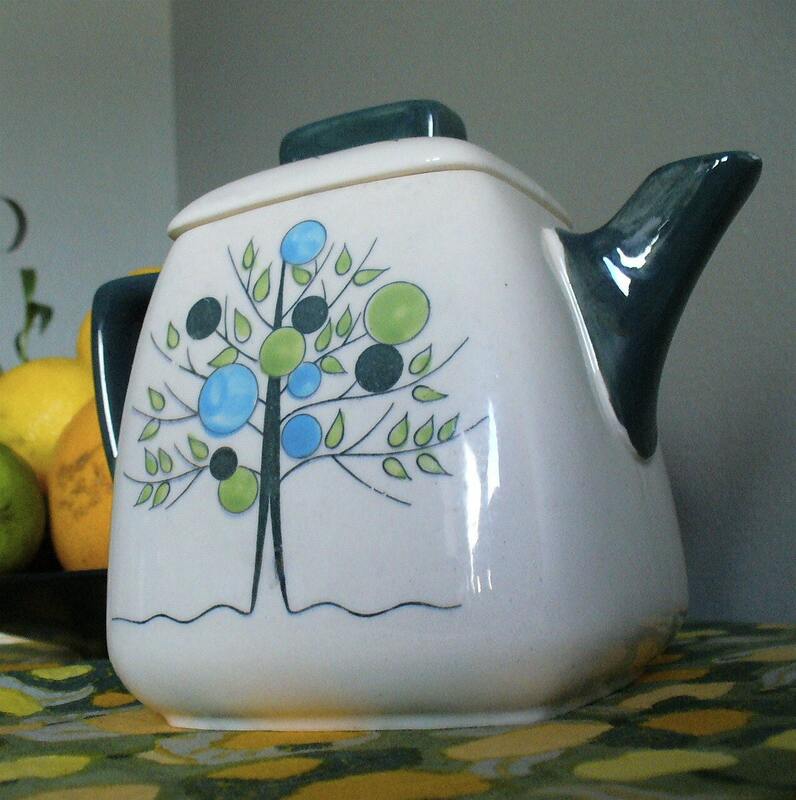 Cute handpainted vintage teapot from Sassy Spaces - love the unusual shape! Flower power Sadler teapot from Violets and Grace - so cheery! 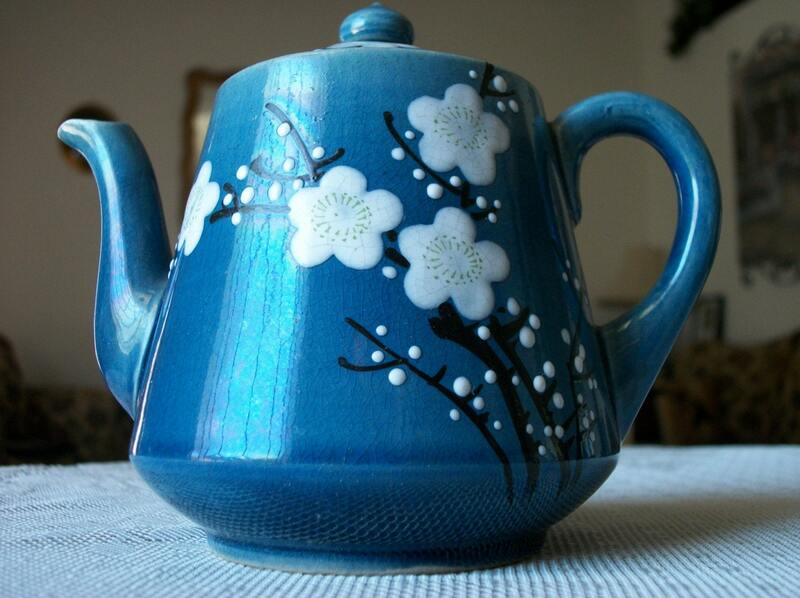 Blue ceramic teapot from merchant of kismet - gorgeous colour and pretty pattern. And this one is my current absolute favourite - am seriously considering shelling out for the postage on this one! 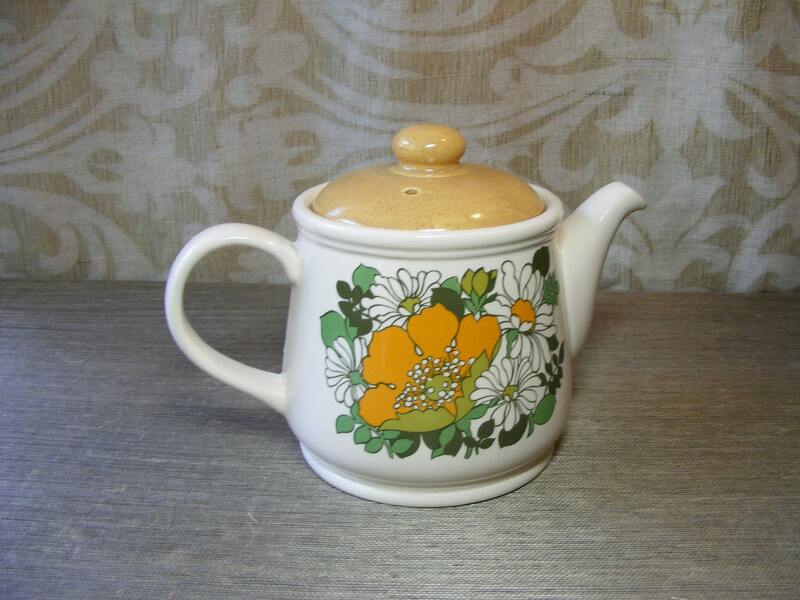 Retro teapot from third coast vintage - how do I love thee; let me count the ways - perfectly cute shape, awesome flowers, nifty lid, great size! 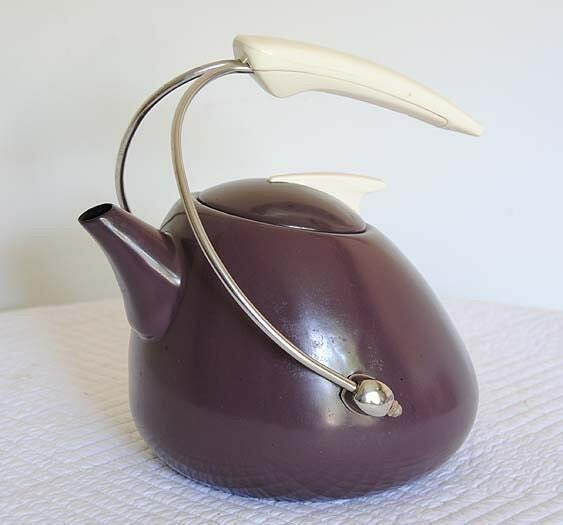 Atomic eggplant tea kettle from DooDah Factory - ok, not technically a teapot but full of WIN! It looks like it is ready to take off on an intergalactic journey - for which of course you would need plenty of tea. I am very much a novice when it comes to matcha; I haven't really had much experience with it since I wrote this post quite some time ago. I have wanted to try it but felt a bit overwhelmed at the range of choices available from O-Cha.com and unsure of whether anything of reasonable quality is available in Australia... You can get matcha from T2, but they only have one kind (clearly I am not the type of person to be easily satisfied am I? Too many... too few... so high maintenance, I know). Recently, however, I discovered a company which I had not previously come across - Obubu Tea. Obubu has been given a good rap on RateTea.net as an ethical company producing high quality teas. And they offer two drinking grades of matcha (as well as some culinary matcha products) - not too many to choose from! I ordered some of each: the Gokou and the Uji. I was not at first sure how much to use; one website I looked at suggested 1/4 teaspoon in 1/2 cup of hot water. I tried this but it seemed very weak and tasteless to me, despite some creamy sweetness. So I contacted Ian from Obubu via Twitter (so handy, Twitter is!) and asked about his recommendation, and he pointed me in this direction. Just under a teaspoon in 1/4 cup of hot water, okay. So I tried that just before with some of the Uji matcha (my whisk and whisking skills are sub-par, I fear, so I was not able to produce the very nice creamy looking froth on the top)... and whoa. It's powerful stuff. Quite bitter and very, very 'green' to my taste buds; some sweetness in the aftertaste. It does not taste anything like a sencha; there is no brothiness, no 'seaweedy' taste. I feel like saying 'grassy' but that's not quite the right word either. I'm not sure how to describe it. 'Green' is the best I can do - and not even a specific kind of 'green' either. Just quintessential greenness! I think matcha will be an acquired taste for me. I am definitely willing to acquire it though! And I feel ever so awake and alert and calm. Heh! I don't really have a single tea that I could say is my 'breakfast' tea. I tend to drink something different each day depending on what I'm having for breakfast. The other morning my husband decided that we needed French toast with maple syrup and bacon - not perhaps the wisest decision on a weekday morning when (as it turned out) he had a relatively early meeting to get to work for, but that's as may be - which set me hunting through my pantry for an appropriate tea to go with such a hearty, savoury yet also sweet, breakfast. It's common for Western-style breakfasts to be accompanied by powerful, wakey-uppy type teas, typically blends involving Assam and other brisk black teas that take milk and sugar well. See for example this brief Wikipedia article on English Breakfast tea, and for my thoughts on some common breakfast blends, have a peek here and here. If I'm going for one of these kinds of teas, Irish Breakfast would be my pick. However, I actually opted for some genmaicha to have alongside our impromptu fancy breakfast. Genmaicha is a Japanese tea blend containing green tea and roasted rice kernels; perhaps a slightly perverse choice for morning drinking as the lower proportion of tea leaves means that it is significantly lower in caffeine content. It's not something that I drink on a very regular basis; it's an intensely savoury tea that tastes predominantly of the roasted rice with little green tea flavour (at least this is the case with the brand that I have, which is made by Ujinotsuyu). It is an excellent partner with many kinds of savoury food though, and went quite well with the smoky, sweet flavours of the maple syrup and bacon. Other teas that you might like to consider with a substantial savoury breakfast include Lapsang Souchong (or add a little pinch to your regular plain black tea) or a darker-roasted wulong (oolong) like Da Hong Pao. Chinese gunpowder green could be good too, and plain or vanilla-flavoured rooibos would also be a great herbal option. I'd definitely steer clear of anything very flowery or too light. Barm Brack is an Irish fruit loaf, often served with a cup of tea in the afternoon; it may be yeasted, or not. The version I made is unyeasted, and could not be simpler. You are meant to soak the fruit in the tea overnight; I wasn't that organised but it didn't seem to matter (thought I should probably do it properly next time). The recipe in the NMAA book says you can use mixed dried fruit or a single one; I opted for currants and soaked them in a strong cup's worth of Ceylon tea - although I suppose Irish Breakfast would be most appropriate! Mix the currants and sugar together and soak in the strained hot tea for an hour or so (or ues cold tea and soak overnight). Stir the flour and the beaten eggs thoroughly into the fruit mixture. Pour into the prepared tin and bake at 150C for about 2 hours (mine took about 1 hour 50 minutes). Allow to cool for 15 minutes in the tin, then turn out and cool completely. Serve sliced with butter and a cup of your best black tea. I can't tell you how well this went with a pot of Margaret's Hope 'Silver Moon' second flush Darjeeling (from Thunderbolt Tea) - the currants and the muscatel flavour of the Darjeeling were perfect together. *My mum cooked lots of stuff from this when I was little, and still goes to it for many cakes, which are all delicious. She bought me a new copy just before I had Pippin; it is unchanged - and I mean unchanged, curried sausages with sultanas and all - from the original 1975 version. I'm not game to make the curried sausages as I have less-than-fond memories of them from my childhood, but the cakes and slices really are excellent. Last Sunday we ended up at Federation Square after a walk along the Yarra, and found this cafe, next to the NGV Shop, called Jolimont Expresso. I was very impressed with the terrific display of teapots and things that they had in one window. Some were new, some quite obviously vintage. Loved the shape of the large white pear-ish-shaped teapot! And the vintage Weet-Bix tin! Their tea selection was entirely brought to you by T2, but since they had a much larger range than the usual run of the mill offerings, I was quite happy. There were quite a few teas you dont see at cafes very often including Girlie Grey, French Earl Grey (yum), rooiibos... I opted for a pot of Red Fancy Fruit, one of my favorite flavored rooibos blends. The biscuit my husband had with his affogato was a bit mediocre and I didn't try any of the other food, so cant speak to that, but as a place to go and have a pot of tea, not a bad option for when I'm out and about in the city. I came across a link to this interesting article about the increase in the number of small farmers producing tea in Assam, India. The farmers grow the leaves and then sell them to larger companies to be turned into made tea. This can provide a significant and steady source of income for the farmers, which is great, although there may be some concerns about quality. However, since better leaf fetches higher prices at auction, i presume there's a strong incentive for the farmers to improve where they can. Also spotted via Twitter, my main (only?) connection to the external world since I never pay any attention to current affairs, this article about Lipton in the US getting warned off by the FDA for making tea-related health claims. It is simultaneously funny and depressing to see companies claiming that their highly processed, sugar-filled, RTD teas are 'good for you' - come on, it's non-fizzy soft drink, people! Plus it appears that the antioxidants in tea degrade over time, so fresh is going to be better than bottled - but we knew that anyway! Tea is generally considered to be safe, even in large amounts. However, two cases of hypokalemia (abnormally low serum potassium levels) in the elderly have been attributed to excessive consumption of black and oolong tea (3-14 liters/day). 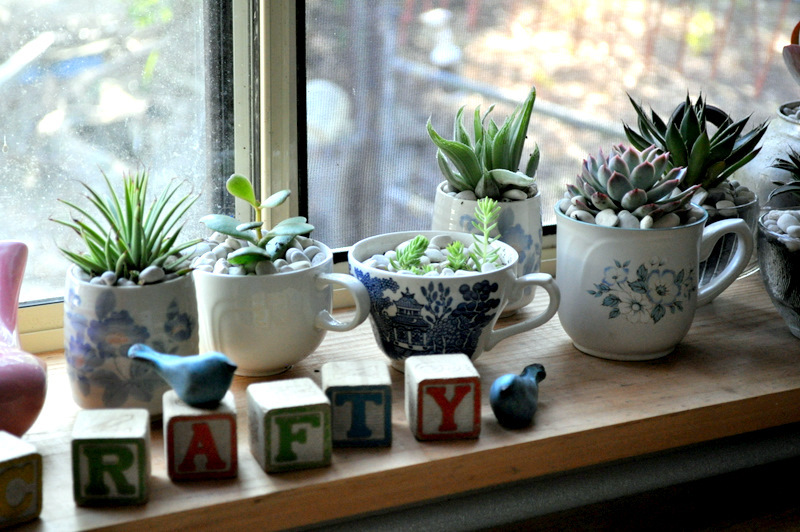 Jess made a teacup succulent garden - doesn't it look beyond terrific, like something from a magazine shoot! And Deb shares tutorials on how to make mini cake stands out of old plates and other crockery, including teacups - great for cupcakes or small things. A couple of weeks ago I received some information from my local council regarding the requirements for a home based food business. On the basis of this information, after doing some investigating and calculating and careful thinking, I have come to the conclusion that Joie de Tea 'the shop' is not currently viable. I can't meet the council's requirements at this point because to do so would require a substantial financial investment and on top of that the amount of time I would need to put into the business to make the financial investment worthwhile would substantially detract from my ability to care for ten month old Pippin. So it is with mixed feelings that I declare my shop closed for an unspecified duration. I am hoping to use the spare time that I have to improve my knowledge of both tea and business so that in a year or two I will be better placed to start up the shop again with a bang! A huge thank you to all my customers who have supported the shop and enjoyed my teas over the last 12 months or so. I appreciate it greatly! Oh, and the blog will still be going strong with reviews and musings and snippets about tea, so please do keep reading. Battle of the Japanese Greens: Round Three! I've been trying not to have too many packets of tea open at once (tempting though that is) but seeing as I worked my way through my other bags of Japanese tea (see here and here) and am nearly out of Chinese green as well, I thought it was time to crack open my Yabukita deep-steam sencha that I got in Sydney from the Taka Tea Garden shop at the Strand Arcade (where I also got my lovely tokoname teapot!). Because this is a deep-steam (fukamushi) tea that has been steamed for a touch longer than regular sencha, the leaves are more delicate and almost dissolve into mush once brewed! Yabukita is the name of the cultivar, widely grown in Japan for its adaptability. I love this tea! I brewed about 1.5 teaspoons in my tokoname pot (which holds a bit less than 300ml) for 40 seconds, then 1 minute and then another minute. Each infusion was delicious, but the first two were the best. The dry leaf doesn't smell of much, but the wet leaves have an incredible aroma that I can only describe as toast with strawberry jam... bizarre I know. The liquor is mildly grassy, with the second infusion having a noticeable fresh artichoke flavour (this diminishes as the tea cools though). The aftertaste is long-lasting, slightly lemony and very sweet, leaving your mouth feeling refreshed. I have just finished drinking my third infusion and am going to add some cold water to the leaves for a few hours to see if I can get anything more from it. Definitely recommended, a very friendly tea to brew and drink! The liquor is a very very pale greeny-yellow and tastes lightly toasty, and has a lovely lingering sweet aftertaste. This is probably the nicest Longjing that I've ever had, and certainly the nuttiest-tasting. I think it actually does taste of chestnuts (although it probably also helps that I had some actual chestnuts not that long ago, so the taste is still reasonably fresh in my memory). I'm enjoying the Tea Geek course very much... scribbling away in my notebook and trying to remember the names of different provinces (true Longjing comes from Zheijiang! But don't ask me where that is on a map! ), and oh yes, catalysing a spot of myth-busting as well! Good times!